Starting in the spring of 2015, some of my readers have not been able to successfully validate their blogs for Recipe pins using the markup from this tutorial. It seems that Pinterest may have changed some of the requirements, but hasn't updated the documentation for Recipe Rich Pins yet. Since the documentation hasn't changed I don't know what is different about the Recipe validation process. I'll keep an eye on the documentation to see if updates become available. It can't hurt your blog to add this markup — it's recognized by other search engines, too — but it may not get you validated for Recipe Rich Pins. I'm a total foodie, so I'm excited to share a little something special for food bloggers today! In this post I'm going to show you how to enable recipe Rich Pins for Pinterest on your Blogger blog. If you haven't seen them yet, Rich Pins are Pins with a bit of extra information on them — for recipes, you can add ingredients, instructions, cooking times, and more. 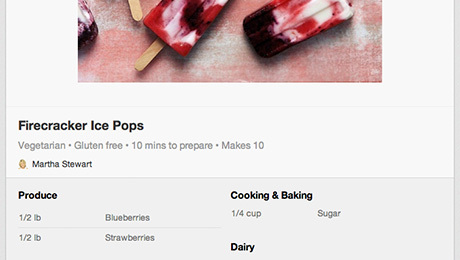 We'll use hRecipe markup to enable Rich Pins in recipe posts. You can use this markup to turn any recipe on your blog into a Rich Pin-able recipe, even if you're not exclusively a food blogger! I'm going to show you how to write the markup "by hand" first, then share a few free online tools to help you write your markup faster. Ready to get started? Let's do it! The majority of the Rich Pins markup goes into individual posts, but I'm going to save you a little work by giving you one line of code to add directly to your template. First, back up your template (instructions here). Do not skip the backup. Next, open up your template by clicking the "Edit HTML" button below your "Live on Blog" screenshot. Find the <head> tag near the top of your template code (it's usually in the first 10 lines). Replace "YOUR SITE NAME HERE" with the name of your blog. You can do that as a title (for example, "Code it Pretty") or as your blog's URL (for example, "www.codeitpretty.com"). Next, press the orange "Save template" button to save your updated template. 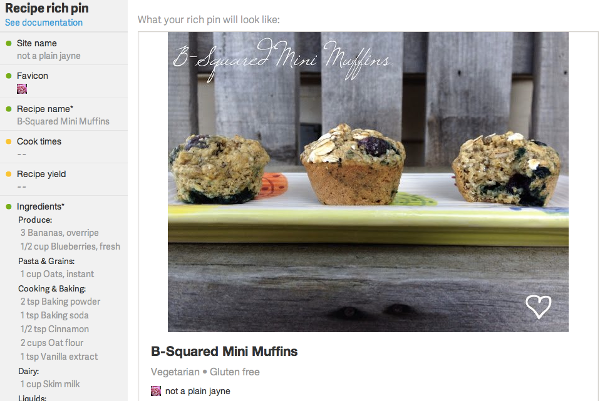 I'm going to show you how to completely mark up a recipe to make a fully detailed Rich Pin, but you should know that Pinterest only requires you to mark up two parts of your post for Rich Pins: the title of the recipe and at least some of the ingredients. If you want to leave a little "mystery" to entice Pinterest users to click through to your post, you can just mark up the title and key ingredients. Nothing else is required. For best results, start with a recipe that has already been published on your blog, and has also already been Pinned to Pinterest. Also, if you don't already have a favicon for your blog, add one! 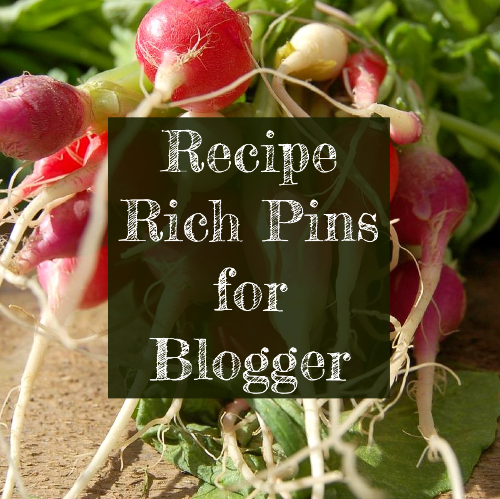 It will show up on Rich Pins from your blog. Open up a post you'd like to make Rich Pin-nable and switch to the HTML editor by clicking the HTML button at the upper right of your post editor. The HTML button turns a slightly darker grey when it's selected. Pinterest needs a signal to know your post includes a recipe, so we're going to wrap the recipe portion of your post with an HTML element called a div. That closing </div> tag is super important. If you leave it off, your sidebar will get pushed to the bottom of the page, so don't forget it! Again, the closing tag is important, so don't leave it out. You don't have to mark up all of your ingredients, but it's helpful if you include the major stuff. Each ingredient needs to be marked up individually with the class "ingredient". Repeat the process for each ingredient you want to mark up. The effect is the same as adding a span tag, it just saves you some time! To change the time markup to match your recipe, change "title" value to the correct amount of time. Minutes are indicated with a capital M, hours are indicated with a capital H.
When you're all marked up and ready to publish, press the orange "Publish" button up top. Your published post will look normal to your readers — the little bits of markup we added around your recipe won't be visible in the published post. But, if you view your page source you'll see everything you just added to the post. Go to the Rich Pins Validator on Pinterest's developers site and submit the link to your post with rich pin markup — not your home page. If your URL fails, don't get discouraged. Mark up another recipe and submit that one, making sure to include the recipe name and ingredients markup. It can take a few tries before the validator recognizes your markup, even if it is correctly formatted. When your URL passes, you'll be prompted to apply for Rich Pins. Click the "Apply Now" link to continue. On the next screen, check the "website domain" field. If you have a .blogspot.com URL, you'll need to correct the URL to your blog's actual address (for example, codeitpretty.blogspot.com). Set the "Data Format" radio button to "HTML Tags" and press the red "Apply Now" button. After you apply, you'll see a preview of how your Rich Pins will look. The screenshot below was provided by Olivia Morrissey from Not A Plain Jayne, one of the early testers of this tutorial. Pinterest takes a few days to approve blogs for Rich Pins, and will notify you by email when you are approved. Olivia got her approval notification in 4 days. If you need a little help speeding up the process, there are two free online tools you can use to generate your markup. RecipeSEO.com is an online recipe builder that generates hRecipe markup for you. If you use the Chrome browser, you can use the hRecipe Helper extension. Image in title card CC-BY Flickr user ilovebutter.